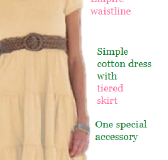 The Natural Ingenue woman's best look is sweet and girlish, but also comfortable and relaxed. Follow Truth is Beauty's board Natural Ingenue on Pinterest. You know you're a Natural Ingenue. This one-page visual guide shows you how to put together a Natural Ingenue ensemble.